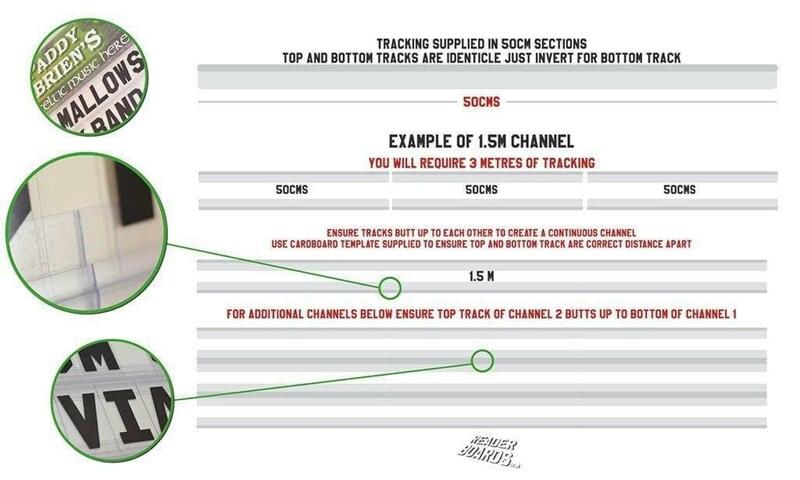 You will always receive an extra section of tracking, please use this as a test piece. Apply to wall and examine how well it sticks first. If it doesn’t create a good bond immediately you will need to consider additional gluing. When applying tracks to a surface, use an object such as a reverse of a small spoon to apply maximum pressure as possible onto the tracks to encourage the best ‘bond’ possible. This will improve the adhesive quality and minimise any chance of the tracks becoming loose later. When using our clear tracks on back lit boards, traces on the adhesive may be come visible depending on the strength of light source and finish of your back lit material used on the board. When using both our letters and tracking in an outdoor environment, the plastic used will be exposed to both UV and year round weather. Deterioration is therefore inevitable. Staining will occur as a result. If we are made aware on any outdoor use, spare tracking will be provided free of charge for any future repairs. If we are not made aware additional tracking can be purchased separately. Protecting your sign with a plastic fascia is HIGHLY RECOMMENDED to extend the life of your sign’s letters and tracks. Readerboards will not be held responsible if you sign is damaged due to wanton vandalism. Our tamper proofing outdoor projects undertaken in our workshops are designed to deter vandalism and tampering of your message. Our tamper proofing is fit for purpose. By accessing readerboards.co.uk you agree to the use of the website as directed in these terms and conditions. Contact Information: On contacting or ordering, readerboards.co.uk keeps contact information in order to allow us to contact individuals regarding the status of the order and future promotions. If you do not wish to be added to our mailing list please contact us. We do not pass details on to third parties. Variation and Termination of Content: Readerboards.co.uk have the right to amend, remove, vary or terminate content of the website at its discretion and without prior notice. This includes pricing, postage and the terms and conditions. Offers: Offers and promotions change frequently and the offers are only available against products where stated. Returns: If for any reason you are not satisfied with your order, we are more than happy to refund or exchange any unused goods. Please return the unused item in a re-saleable condition (complete with labels), your name, address and order number within 14 days of purchase. Unfortunately, we do not offer free returns and suggest parcels are returned recorded delivery as we can’t refund missing goods. Once the parcel has been received, we will refund your order within 14 days of receipt. Should a problem occur as a result of a faulty product or a mistake on our part within 14 days of dispatch, we will refund postage costs incurred by the customer upon proof of payment. Claims for faulty items made outside of the 14 day timescale will be processed at our discretion and only if the claim is made within 14 days of delivery. Items displaying damage or defect deemed to be a result of fair wear and tear or neglect will not be regarded as faulty.